The "Napoleonic Way" (Strada Napoleonica) is a scenic walk overlooking the city: for many, a popular place for a stroll after Sunday lunch. For local free climbers, however, it is also an outdoor space for meeting friends and training with and without ropes (practicing bouldering or "traversi" as they say here). 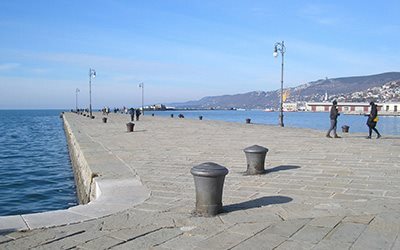 The area is both convenient (parking is just a few metres from the walls and the area is close to Trieste and accessible by car or public transportation) and beautiful, thanks to the view of the sea, the Karst plateau and the city. Even in the winter, it is comfortable with a mild climate, due to a sunny position sheltered from the wind. In the early 1970s important climbers like Enzo Cozzolino (a lookout point is dedicated to him) attempted increasingly difficult climbs along the Napoleonic Way, where the sport's popularity has grown generation after generation. The number of local climbers is continually increasing, as is attested to by the four gyms for indoor training (three in the city and one just outside). The area has countless cliffs. In the Province of Trieste, the rock climbing areas are concentrated in two zones. On one side of the province, there is the coastal area and the Karst embankment. This is where the previously-mentioned Napoleonic Way is located, with its various sections (the Classica, Scudo, Lastrone Giallo, Mano di Fatima, i Calabroni, etc.) both on the trail and above and below. The area also has the beautiful and tough Costiera ("the cliff"), for true connoisseurs, and the new Costiera, which is just above the sea. Other cliffs are scattered about, including (in Sistiana, Duino and Aurisina). On the opposite side of the province, the Rosandra Valley offers a wide range of activities for mountaineers as well as free climbers. Recommended climbs are the Giardini d'Inverno, with easier routes, and the Parete di Bagnoli (called the "Canarini" by locals), where people who enjoy climbing rock overhangs will not be disappointed. A few of the walls that are very popular with locals are located just beyond the border near Muggia - Ospo, Mišja Peč and Črni Kal - and offer hundreds of bolted routes. The first two are internationally renowned for their beauty and variety of routes, which reach up to 40 metres in a single pitch. Mišja Peč is a very high, splendid rock overhang with challenging routes, including two routes graded 9a. Ospo is an "all around" cliff with grades for all tastes, including long, splendid slabs of rough, yellow limestone as well as very challenging rock overhangs (up to 9a). The Ospo high wall also offers a large number of multi-pitch routes (bolted for sports climbing) that measure up to 140 metres. All of the information and route maps are provided in the guide "Arrampicare senza frontiere" (Edizioni Sidarta, in Italian, Slovenian and English) or the guide "Plezanje po kraškem robu/Climbing on the Karst Edge" (published by Krimp, in English and Slovenian). Both of these guides can be purchased in the Transalpina Bookshop (www.transalpina.it) or sporting goods stores. Finally, it seems everyone forgets about children - but not us! If you want your young children to enjoy an adventure-filled afternoon while you relax, try Adventure Park. Located in the woods in Aurisina, this adventure park managed by the staff of the Gravitazero Gym is only open during the summer. The park lets children burn off excess energy on courses suspended amidst the trees, in complete safety thanks to harnesses and supervision by the expert staff.